In the world of business, growing importance is attached to international operations. Globalisation is here to stay. Your message should be understood in each language. We will be happy to help you in your international communication and, if requested, we will put together teams of experienced and specialised interpreters. Our cooperation partners will provide excellent interpreters who are well versed in the fields of business, law and politics. 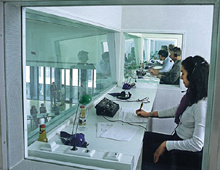 We will be pleased to submit the most cost-effective proposal for you from a pool of interpreters. Of course, we will also coordinate written translations of your conference documents.